One Savvy Mom ™ | NYC Area Mom Blog: American Girl Valentine's Day Mini Mailbox Doll Craft + American Girl Magazine Celebrates It's 20th Birthday With A Cover Contest! 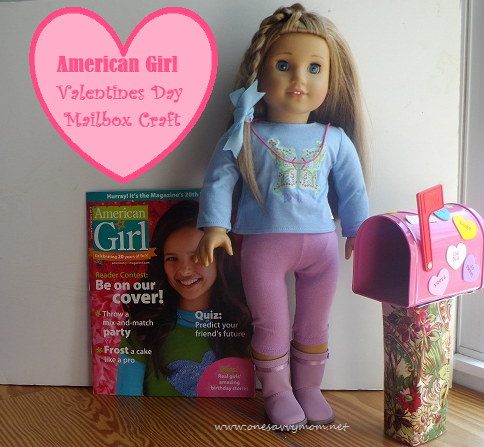 American Girl Valentine's Day Mini Mailbox Doll Craft + American Girl Magazine Celebrates It's 20th Birthday With A Cover Contest! American Girl Magazine is Celebrating it's 20th Birthday with a SUPER FUN party themed issue! The January / February issue is packed with fun party themed idea's, games, recipes, puzzles, stories and crafts. One of the crafts that we absolutely loved creating this month is pictured above. This doll sized mini mailbox is perfect for delivering cute cards and packages to your dolls this Valentine's day and remains a fun element for creative doll play all year long! **Acrylic paint in your choice of color [ if your using a wooden candle stick as the post for your mailbox]. In addition to all of the FUN that American Girl Magazine has packed into their January / February Edition, they are giving girls ages 8 and up, the chance to celebrate the 20th Birthday of American Girl Magazine IN A BIG WAY! Girls will have the opportunity to enter for their chance to appear on the cover of an upcoming issue American Girl Magazine ["The Best Of AG Issue"]! To enter the contest girls can submit a photo of themselves with their best friend, along with the story of their friendship [ in 500 words or less]. Entries must be post marked by February 28, 2013.